Saint Hilary of Poitiers, (b. 315, died 368) was one of the greatest theologians during a very troubled period of the Church. 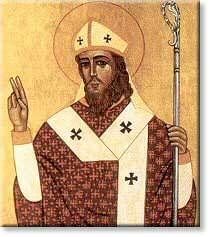 St. Hilary was a defender of the divinity of Christ and strongly opposed the heresy of Arianism. He became Bishop of Poitiers in Roman Gaul and was known as a brilliant scholar with a humble gentleness. This valiant champion of Christ created the first hymns used by the Church in the West. Introduced Eastern theology to the Western Church. St. Hilary was proclaimed a Doctor of the Church in 1851 by Pope Pius IX. Hilary was born of a wealthy noble pagan family in Gaul. He spent his youth in the study and he himself testifies that he was brought up in idolatry. Hilary ardently set about learning what God is. He was told many things about the divine. His heart told him what others had said of the divine were wrong. First, he discarded the approach of many people around him. Hilary found the true God by chance, while reading Hebrew and Christian scriptures. He read Exodus 3:14, "I AM WHO I AM." Hilary said, "I was frankly amazed at such a clear definition of God, which expressed the incomprehensible knowledge of the divine nature in words most suited to human intelligence." Hilary found confirmation that God was everywhere and omnipotent. Finally his soul was at rest. He had found who he was in discovering God and God's Son Jesus Christ. From that time forth, he so squared his whole life by the rules of piety, and so zealous were his endeavours to confirm others in the faith of the holy Trinity. Before his conversion, he was married and had a daughter named Apra, yet he was chosen as Bishop in 353. The only married Doctor of the Church. His teaching and writings converted many. Hilary really had known very little of the whole Arian controversy that was feverishly spreading. The Arians had much power in the Church, including the support of the emperor Constantius. When Constantius ordered all the bishops of the West to sign a condemnation of Saint Athanasius, Hilary refused and he was exiled into Phrygia from Poitiers in 356. Being exiled from his home and his duties gave him much time to study and write everything he could about the Arians. He began to write, "Although in exile we shall speak through these books, and the word of God, which cannot be bound, shall move about in freedom." He remained in exile for three years in which he wrote 12 books 'On the Trinity, against the Arians.' In them, he proves the Father, Son, and Holy Ghost. The emperor had called for a Council to oppose the recently held Council of Nicea. Hilary was invented by semi-Arians hoping to reconcile with the West. Hilary attended and staunchly defended the Church. The Arians, dreading the outcome, pleaded with the emperor to send this troublemaker back home, which he did but without reversing the sentence of his banishment. On his way home, he took a leisurely route through Greece and Italy, preaching against the Arians as he went. Hilary was received at Poitiers with great demonstrations of joy. The death of Constantius put an end to the Arian persecution. Scandals were removed, discipline, peace and purity of faith were restored. Hilary died of natural causes at Poitiersvc in 368. He is the patron saint of Argusto, Italy. Also, the patron saint against snake bites. This page was last modified on 13 July 2016, at 08:57.